Salad Bar Parenting: A buffet of ideas, practices and products loved by a Motherhood Collective Mom. Depending on your season of parenthood or mothering philosophies, you may pile on what works for you or pass the salad tongs to the next Mom. Hello. My name is Laura and I am addicted to babywearing. It all started with my Moby. After having my daughter via C-section, I had to wait several weeks before I could carry her 10 pound body around safely. I began carrying her in her carseat as soon as I was able. However, the weight and awkwardness of that plastic basket injured my back to the point that I had difficulty sleeping. 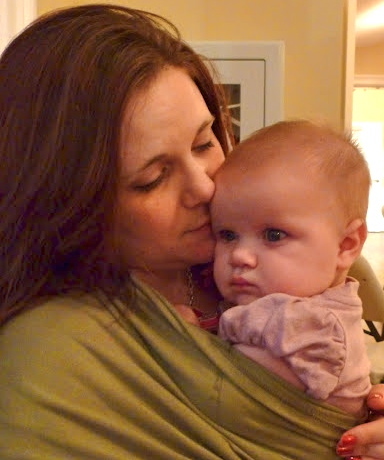 Rather than give up carrying my sweet daughter, I began wearing her in a Moby stretch wrap. Thus began my love of babywearing. To help those that want to learn more about babywearing, I gave each of my 6 carriers a rating of 1 out of 10, 1 being the "worse than a carseat" and 10 being "this is the best thing in the world". I also compare each one to shoes to describe the comfort. I don't cover many technical details about each carrier, I only speak about my personal experiences with them. If you're looking for a detailed review that talks about the measurements and where it's made, I'm not your girl. If you want just a quick play by play of the carriers we've used and how we like them, then you’re welcome. From 0-4 months, my olive green Moby was my favorite. It took about 30 minutes to master but it was well worth the practicing and frustration. It's incredibly versatile and stretchy - perfect for beginner mamas and beginner babies. They retail from $25 - $40 and are found at most major baby stores. Joanna could fall asleep within minutes of me putting it on. I also liked it because it fit over my large chest and didn't irritate my C-section incision. Like a strappy flat sandal: cute but not great for long-term use. My yellow and red Seven Sling was my emergency sling when Joanna was under 20lbs. It's valued at $40, but it was "free" with $12 shipping and $5 fee of some kind. It was great to keep in the diaper bag in case I forgot to bring a carrier. The sizes run small so I bought a size 5 even though the chart said I needed a size 3. It fit perfectly for several months. The Bjorn is like the 1980s Cadillac of carriers. They retail for $100 - $150. The price makes it seem like a good carrier, but it’s painful for the wearer and the baby. It hurts your back and doesn't support the baby's hips and legs properly. They can be especially uncomfortable for little boys. I could last about 30 minutes before I would want to put her back in her car seat and carry her. I only used the Bjorn a handful of times. Like one of those weird "foot shoes": it takes time to get used to before it feels like a second skin. Woven wraps are the most versatile way to wear your baby. They can be difficult to learn but they have a very dedicated following. (Just ‘google’ woven wrap and you’ll find a myriad of websites and videos dedicated to the many ways to wear your baby.) You can also do a back carry with woven wraps - you cannot do a back carry with a stretchy wrap. Like a supportive canvas shoe: I can wear it all day but it can get a little warm and sweaty. I have come to the conclusion that I’m a structured buckle carrier kind of girl. This style is my go-to carrier when I need something quick, easy, and comfortable. The Boba stays in the car at all times so I always have it on hand. There are multiple points of support (unlike the Bjorn) so it doesn't hurt after 5 minutes of wearing it. I've been able to wear her for hours of walking without pain. They can retail from $130-$150. It is WELL worth the investment! This carrier will fit Joanna until 35 pounds. The only reason this didn't get a 10 out of 10 is it gets a little warm in the Virginia humidity. It's all cotton and black, so that was my fault for not choosing a lighter color. The Onya is one of my favorite purchases. When we first got it, it seemed too big for her. It collected dust until she was 6 months old. When I brushed it off and put her in, it was perfect! I bought the Onya Outback, which is a more rugged structured carrier. It's mesh and nylon compared to my cotton Boba. It breathes beautifully in hot weather and it even comes with an attachment so she can sit in a chair safely! Genius. My husband prefers this carrier because it looks more manly. It's super comfortable, breathes well, looks nice, and Joanna loves it. Here is a great review of the Onya. The best thing to do is find a retailer that sells multiple brands. It's like finding a good pair of shoes - you have to try them on to find the best fit. There are also Babywearing groups in many cities where you can attend and try on different types of carriers. You can also learn about other types of carriers like ring slings, mei teis, Ergo, Beco, and many more. I am a member of the Babywearers of Lynchburg and have learned so much about how to safely and comfortably carry my baby close to me.